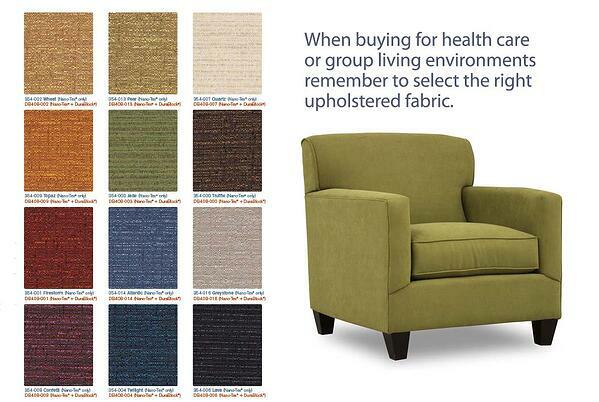 When selecting contract fabrics for upholstered furniture, there are many things to consider. Contract furniture is always “made to order” due to the enormous variety of furniture styles and fabric types, finishes, patterns and colors. The possible combinations that can be created imagining the endless number of furniture styles plus hundreds of thousands of upholstery fabric and its variables creates a dizzying assortment of potential groupings. While you can expect contract upholstered furniture to take a few weeks to produce, you may be surprised by the pricing which rarely feels like “custom” pricing. The truth is that contract upholstery sales costs far lower than its residential / retail counterpart so while the options are more plentiful, price is actually lower and quality is substantially higher than retail. Fabric for contract upholstered furniture can be a daunting task. Choosing color, pattern, fabric type, and performance characteristics is a lot of decision on top of selecting the style of the furniture itself. While the technical aspects of fabric performance are important, let’s first focus on the more visible elements. 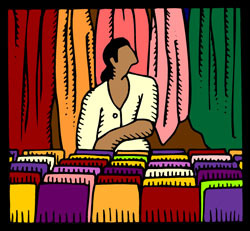 Color is an obvious consideration. Color sets the mood for a room, especially if you are adding big pieces of furniture like sofas, loveseats and lounge chairs. Depending on the existing décor or tone of your facility, color can be used play up contemporary elements of the buildings design or conversely can be used to tone down more dated elements. Warm colors complement traditional designs and cool colors tend to highlight contemporary design. Mixing colors within a single room setting can add drama and can improve the overall look of a room compared to a single, repeating color. When mixing colors, look for colors that harmonize rather than contrast to create more of a designer look. Be careful not to choose colors that are too light. Whites and light earth tones are very “in” right now for residential design but tend not to perform well in contract facilities even when treated with soli and stain resistance. Instead, look at deeper solid earth tones with texture. The textures add an additional natural element without compromising the dirt-hiding properties of darker tones. Pattern is probably the most intimidating selection for many contract buyers. Patterns do not always age well. What is hip and trendy today might quickly end up looking like yesterday’s news. Big, graphic patterns can be the riskiest patterns choices but the right selection can really add drama when the building design lacks character. The scale of the pattern should be in balance with the size of the room so large, bold patterns would not be an ideal match for a small room with small-scale furniture. Large, open spaces can accommodate more pattern. A designer trick for using large pattern in a room is to find a color that is present in small quantities in the patterned fabric and select a solid color fabric in that color. Use the large, bolder pattern on chairs and loveseats and use the solid color on the larger pieces like sofas to create a high-end look. The higher the thread count, the more durable the fabric since the weave of the material is denser and therefore more durable. Additionally, consider whether the pattern is woven into the fabric or whether it is printed on top of a solid color fabric. Woven patterns will wear far better than printed patterns. Double rub results measure the number of times fabric can withstand being rubbed together under standardized, laboratory testing. The higher the double rub results the more durable the fabric. Results from 15,000 double rubs on up indicate better performance for heavy-use environments. Results as high as 100,000 and above are commonly available from contract furniture suppliers. Fibers can be mad made or natural. Man made fibers like acrylic, nylon, olefin and vinyl offer a higher degree of durability and stain and soil resistance than natural fibers. In addition to their inherent stain and soil resistance, many fabric treatments are available through contract suppliers that offer an additional measure of dependability. Crypton is far and away the most common fabric treatment for contract facilities. Crypton is a process that is applied on top, bottom and within the weave of the fabric resulting in a fluid and soil barrier that keeps fabric clean as well as hygienic. When considering choices for your next furniture project, always contact a reputable contract furniture supplier who understands the needs of your facility.